Over the last few weeks I seem to have spent a lot more time than I should – or would have liked – thinking, writing and talking about “natural” wines. He goes on to say that “we use cover crops, integrated pest management techniques, mechanical weed removal, and composted grape pomace in place of pesticides, herbicides and synthetic fertilizers… We pick when the grapes are ripe, but not overripe. All our grapes (estate or purchased) are hand-picked, which allows for sorting in the vineyard. “Our winemaking philosophy includes fermenting entirely with native yeasts from the vineyard, rather than cultured yeast strains; extracting color, flavor, and tannins from the grapes without use of commercial enzymes; determining—by tasting for tannin extraction during fermentation—how long to continue pump-overs; allowing malolactic fermentation to occur naturally, without inoculation; achieving wine clarity through settling and racking; making major winemaking decisions, including blending, based on tasting rather than a pre-determined recipe”. 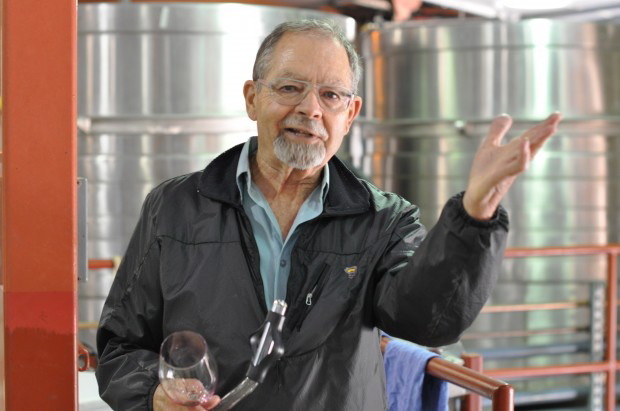 Stated simply, he avoids mechanical or chemical intervention, and believes that wines made with them don’t age as well. What could be more natural than that? Unfortunately, however, Draper might seem to fail a number of “natural” tests. Wines are “occasionally” gently fined with egg whites “if we have a wine lot (or an entire, assembled wine) with excessive tannin”. He avoids membrane sterile filtration, “a process which—to a minor but noticeable degree—affects flavor and complexity” but uses pad filtration to remove “any trace of egg white” from wines that have been fined. Sometimes Draper adds a little water – 1.4% in the case of the 2011 Paso Robles, as the label (wholly unnecessarily) reveals. In an interview with INSIDESCOOP, Draper explains that a small amount of H2O was added to three of eight fermentors to adjust slightly overripe grapes, in the hope of keeping the alcohol closer to 14%. Water addition probably gets the thumbs down from the naturalistas, as quite certainly does the tartaric acid that Draper’s label acknowledges as having been added to the 2011 Three Valleys which needed some “fine tuning”. I really neither know nor care where Ridge and Draper fit within the “natural” canon. What I do know is that they’re my kinds of wines and Draper is my kind of winemaker. On the one hand, he really does want to produce wines as naturally as reasonably possible, with a sense of the place where they were made; on the other, he cares about the consistency and quality of my experience as the person who’s shelling out real money for his bottles. Draper adds interesting fodder for the question of 'natural' wine. I am glad to see too that you appreciate my photo of Draper, and my writing about him. Could you please put the named reference to my write-up within your post to show appropriate reference, as you do with Feiring's and INSIDESCOOP and the (z)infindel. Thank you! Much appreciated. Thanks again for your contributions to this interesting subject. Draper is a fascinating resource for thinking through these issues. Lily-Elaine, please accept my sincerest apologies. I really did not mean to omit credits to you for the interview and (excellent) pic. Omission corrected). Thanks for your understanding – and kind words. Thank you! Much appreciated. Believe me, I understand how these things happen. I appreciate your blog, and am grateful to be included here, even if briefly. I recently hosted a CA tasting and one of our wines was from Ridge and it was undrinkable. Terrible actually. The next day all four tasters had raging migraines. This is the 5th time I have had Ridge wines and had a raging headache. I am trying to figure out the headaches and wine. Some say it is from sulfites, but these were lower sulfite wines. Others say Ph level. I don't know. Do you know anything about this? I find that wines that are deeply oaky and smokey give me a headache and this last wine was an oak bomb. Thanks to share the process of making great wine naturally using grapes.